In an attempt to encash the social networking habits of youngsters and taking a cue from this trend, India’s leading GSM Mobile service operator Aircel today announced the launch of first of its kind “Music Connect” a dynamic VAS with vibrant social experience. The Aircel Music Connect service is all new concepts in terms of Mobile Value Added Services (M-VAS) which provide you with an option to subscribe and share the song you are listening to with your friends through most popular social networking sites Facebook and Twitter. To use and subscribe the service Aircel postpaid and prepaid subscriber may Dial 543219 (Toll Free) from their Aircel Mobile number or they can register by visiting Aircel website (http://www.aircel.com) and look for MusicConnect. The Subscription charges will be Rs.30 per month for 100 Minutes access of the service. Aircel GSM Mobile Service users can subscribe the services via IVR – Dail a toll-free number 543219 or Aircel website (http://www.aircel.com), Visit the site and look for MusicConnect or logon to www.aircelmusicconnect.com. On the product information page click Join now. Follow the instructions to attach your mobile number and your Facebook or Twitter profile. MusicConnect will be currently available as application for Facebook and as tweet on Twitter. To register for Music Connect, you may do so through IVR Dial 543219, After subscription the 4 -digit password will be sent to you by SMS. Or Visit website(www.aircelmusicconnect.com) or social networking site – Facebook. On the MusicConnect website application, enter the Password and your mobile number. Open the application and follow registration process to generate PIN, PIN will be sent to you by SMS. MusicConnect will allow you to listen to the songs of your choice through : IVR – dial 543219 and listen to songs, or on Social networking sites – Facebook open the MusicConnect application and listen to your favorite songs. MusicConnect will let you share the current song you are listening to immediately after registration on the Facebook through application. Your Twitter account will be updated in real time as and when you are accessing IVR and website (www.aircelmusicconnect.com). After the registration for MusicConnect is successfully completed, you will get a SMS notification with your username and password. By default username is your Aircel Mobile Number. MusicConnect provides you with an option to search and listen to your favorite song through the application on your social networking site – Facebook or on www.aircelmusicconnect.com. The search functionality is currently not available through IVR. MusicConnect provides you with the option to create playlist while listening to songs. To create a playlist on IVR Press 6, while the song is playing and on Facebook/Twitter just Click the + sign next to each song Or Website www.aircelmusicconnect.com Each customer gets his own dial-in number for playlist as soon as it is created. The playlist on MusicConnect will be available to you as long as your subscription to the service continues and you hold at least one song in that. 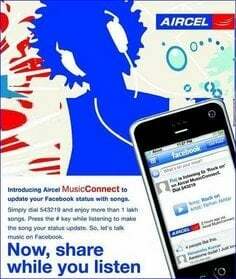 Online streaming is an add-on to Aircel MusicConnect subscription, online streaming is absolutely free for you. As long as you have a valid account and balance left, you can browse the web store front at any point in time!